"Something wrong? Yeah. It's just too bad you don't know what it is." A father and son sit at the edge of a raging ocean, and as they fish, the father offers his son valuable advice about life, trying to instill a strong sense of the values of life as he becomes a man. This would seem a normal father/son conversation about doing the right things in your life, and it is. Yet , that this father is trying to raise his child in one of the worst inner city neighborhoods, South Central Los Angeles, the consequences of teaching your child to do the right thing becomes something more than a necessity. It is moments like these that make John Singleton's debut film Boyz N The Hood stand apart from other films in its genre. More so than other movies about life on the streets or in the inner city, Boyz N The Hood knows that it isn't only important to survive today, but also tomorrow and every day after. The film opens in 1984, and three children are growing up in the bleak and disturbing surroundings of South Central , enforced by the fact that dead bodies are left on display. They learn early in this neaighborhood that even as a child their lives can be in danger, even by their friends. Seven years pass and we are introduced to the three as young adults, each with a new direction in their lives. Tre Styles (Gooding Jr.) has plans to go to college. Doughboy Baker (Cube), has been in and out of jail throughout the past seven years. Doughboy's half-brother Ricky (Chestnut) is on track for a football scholarship, although his life has already changed due to a newborn child in his life. A title card at the start of the film states that horrifying facts that one in every twenty-one black males will be murdered, most at the hands of another young black man. Throughout the films two hour running time the three will test that statistic. Singleton, who has gone on to direct five other films since Boyz N The Hood smartly paces his film in both his directing as well as his screenplay. The story starts slowly and eventually builds bigger and bigger. And when it seems as though the film will fall into cliché, Singleton wisely keeps the film dramatic, rather than settling for mere action fueled hyperbole other like movies generally fall into. In the end the message that Singleton sends is a powerful one about the lack of control over one's life. The cast, then relative unknowns, is full of terrific and surprising performances. Gooding Jr. in his first lead role has an intensity and calmness that make Tre not only the standout character but also the axis of the film. Rapper Ice Cube, in his first film, amazes as Doughboy, especially in the closing scenes. Finally, it should come as no surprise that Laurence Fishburne gives the films best performance as Furious Styles, Tre's father and protector, showing why he is one of the best actors today. Boyz N The Hood is not only a terrific film, but also an important one. While it is a bleak look at life in the inner city, it accurately paints the picture of that world. It should be seen by all, if only for the significance and importance it brings. Image Transfer Review: Presented in its original 1.85:1 aspect ratio with anamorphic enhancement, Boyz N The Hood could look better, but it could also be a lot worse. The transfer has a nice film-like look to it and sharpness and detail each hit their marks quite well. The biggest problem is several moments of edge enhancement that take away from the film itself. Black levels are fine, and there are no elements of pixelation present. A full-frame version of the film is also available. Audio Transfer Review: Boyz N The Hood features a Dolby 2-channel surround mix in English, French, and Spanish. The mix is tame for the most part with only music or the sounds of a helicopter panning across the rear speakers. The largely rap music soundtrack is well represented in the speakers, and dialogue is clear and easy to hear. Extras Review: Three trailers are all that make up the extra features on Columbia Tri Star's DVD of Boyz N The Hood. What is most strange is the fact that besides the films original trailer, the other trailers are for the Cuba Gooding Jr. films Jerry Maguire and As Good As It Gets. Trailers for Singleton's other Columbia films Higher Learning and Poetic Justice are nowhere to be seen. 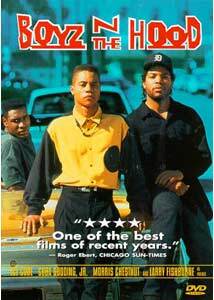 Boyz N The Hood was first released in what can best be described as the infancy of DVD, and it shows here. The video is fine, and the audio sounds nice, yet so much more could be done. The commentary track on the Criterion laserdisc of the film shows that Singleton is up for doing one, so one can hope for a special edition. Recommended based on the importance of the film and the message it carries.